Slippers are like sweatpants. They are comfortable, perfect for relaxing in and there are styles for every personality. Make slippers using fleece for extra warmth and cushion. You don't have to be a kid to wear Mary Jane style slippers like these ones. This free pattern provides a perfect fit for adults. This slipper pattern is a great way to use up scraps and remnants of fleece fabric left over from previous projects. The printable below includes actual-size patterns for a 9 1/2-inch foot. To enlarge or reduce the size, measure your foot. Lengthen or shorten the difference where indicated on the pattern pieces. There is no specific right or left foot, as the pattern is the same for both feet. Click on the pattern image and print. If you have trouble printing the pattern, try these helpful tips. Click to download both pattern pages. Cut out two uppers and two soles from the slipper fleece and two uppers and two soles from the lining fleece. Cut two 2-inch lengths of 1/4-inch elastic. The elastic will be visible so you will want a color that matches or coordinates with your fabric. Cut all pattern pieces from fleece. With the uppers folded in the same way they were cut and the right sides together, pin the short heel ends together. Sew the pinned ends using a 1/4-inch seam allowance. Trim the seams to remove excess bulk. Lay one slipper sole on your work surface with the right side facing up. Place a slipper upper on top with the wrong side facing up. Pin the center toe and center heel together where indicated on the patterns. Continue pinning the uppers around the sole, stretching and easing if needed. Sew the pinned edge using a 1/4-inch seam allowance. Trim the seams to remove excess bulk. Repeat with the remaining slipper pieces for the other foot. Sew the lining pieces together in the same way, but leave a 3-inch opening along one long edge of each slipper for turning. Turn the two slippers right side out. Pin one end of an elastic strip to the upper where indicated on the pattern. Wrap the elastic around the bottom of the slipper and up the other side. Pin the other end of the elastic where indicated. Tack the elastic ends in place to hold. Repeat on the other slipper. Insert a right-side-out slipper inside a wrong-side-out lining. Match and pin the edges of the opening. Sew the pinned edge using a 1/4-inch seam allowance. Trim the seam to remove bulk. Turn the whole piece right side out through the opening in the lining. Repeat with the remaining slipper and lining. Sewing the lining to the slipper. Hand stitch the openings in the lining seams closed. Top stitch around the opening of the slippers 1/2 inch from the edge. To avoid catching the elastic in the stitching, you will need to stop, cut and reposition the sewing machine needle to the other side of the elastic on both sides of each slipper. 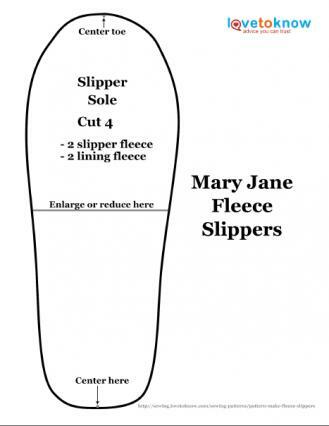 If you are looking for more slipper patterns, try one of these cute design options. Tissuepapers has a quick tie-on slipper pattern that will remind you of Doris Day, Lucille Ball or Rosie the Riveter. These slippers would be fabulous for any woman in your life. It is a great choice for a beginner. Maya Made always wanted a pair of elf slippers. Her vision produced an adorable pattern for booties made using a felted sweater. This is an easy project, but previous experience would be helpful. Jojoebi Designs has a cozy fleece bootie pattern that will definitely keep your tootsies warm. These slippers could easily be made for the entire family. You will not need a lot of previous sewing experience to have success creating these cute bootie slippers. If you're looking for simple sewing projects for kids, fleece slippers are a wonderful first-time project. They are quick to make and the stretch of fleece ensures a successful fit along seams.